Hello. If you found my blog, kudos to you. For whatever reason, blogger is being a bit difficult. These last few days, blogger couldn't find my blog, so I could fix a few type-o's, so it's been frustrating. And then this morning I couldn't log-in to get this post up early. So, I had another latte, and organzied some of my dies, and embossing plates. This week, I am determined to tackle my whole craft room. It has become a bit disarrayed. So, I'm planning on going through boxes, bags, piles, and stashes, and purging. So, look for a few 'bag bags' in my Etsy shop. I will be providing free shipping for those. Yesterday, a very wonderful lady that I use to work with, threw her sister a baby shower. Her sister is expecting her first baby. A boy! And how exciting is that. Well, my friend asked me to make her cake. I love to bake, and cakes/cupcakes are a joy. And since she is a wonderful person and a dear friend, I wanted to make her sister a lovely gift. You know me. Everything comes out match-y match-y. A baby boy. Then the cake board must be blue. And I have an infinity for polka dots, so yes, the cake board was baby blue with silver polka dots. I love how yellow and blue compliment and contrast each other, especially when you select the perfect shades. Authentique and My Mind's Eye helped me with that. The card is a standard A2 size (5 1/2" x 4 1/4") and the paper bag is 8" tall. I started with creating the card. I wanted something pretty, but not too feminine. So I selected this beautiful pattern paper by Authentique: Renew. The colors are simply pretty. 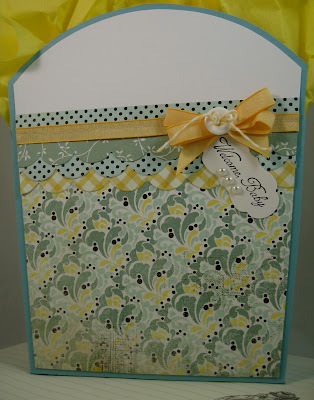 The colors match very nicely with Stampin' Up! 's Baja Breeze, Pool Party, and So Saffron. I like how the pattern papers have a bit of distressing. 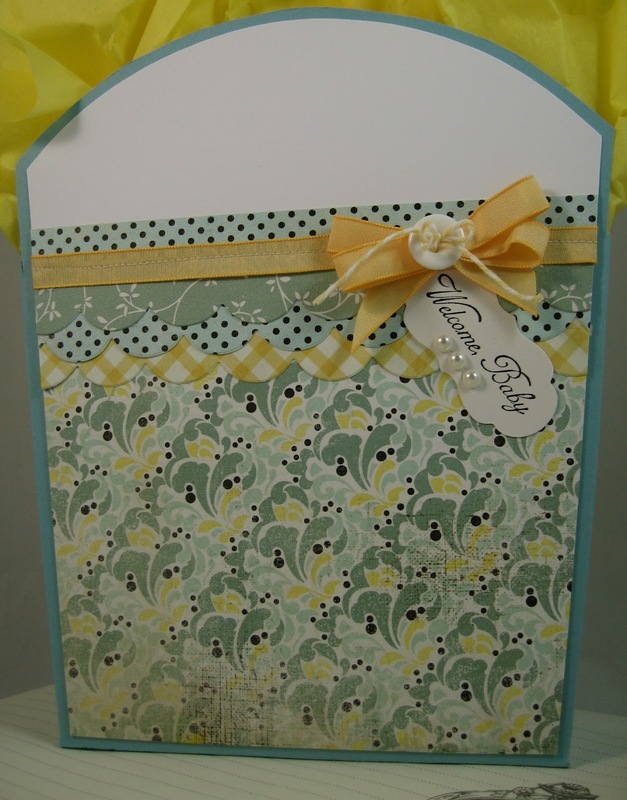 The card base is Baja Breeze cardstock. I cut a piece of Pool Party cardstock a bit smaller to create a matt. I used my Tasteful Trim die to create the collection scallop trims. I just love the larger scallops. It really shows off the pattern papers. I machine stitched each layer of scallops. 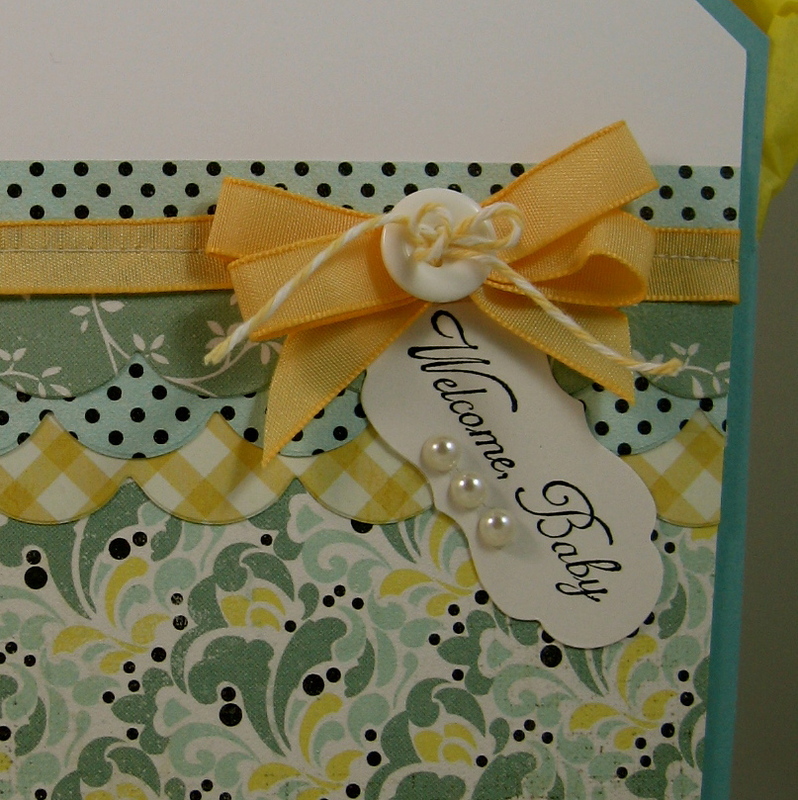 I then tied a strip of So Saffron Taffeta ribbon around the top of the card. I created a multi-loop box and tied a white clear paper trey button to the center of the bow, with some yellow bakers twine. I saw this adorable rubber stamp at a local stamp shop. The baby lamb is actually from an Easter collection of stamps by Prickley Pear. But, isn't it just too cute? So, I stamped the lamb onto white cardstock with Jet Black Staz-On pigment ink. I used my 2-way glue pen to adhere some white flock to the body. I left the lamb's face and inner ears flock-free. 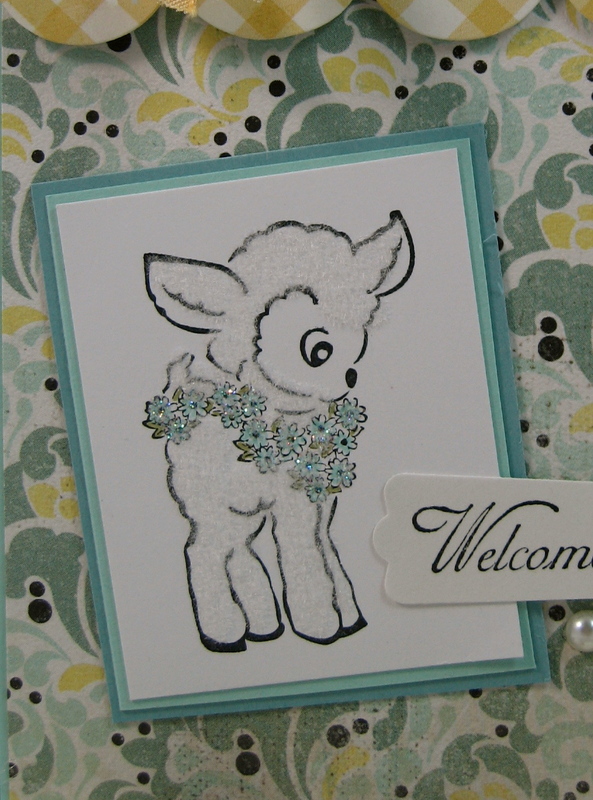 I used my Pear Pizzazz and Pool Party markers to color the flowers and foliage around the lamb's neck. Then I dotted some more 2-way glue to the flower centers and dusted them with some dazzling diamond glitter. I matted the lamb the same way that I matted the card's main panel: pool party and baja breeze cardstock. I added the trio of pearls, because the card seemed to be missing something to me. I used a template that I purchased from Paper Trey Ink, called Around Town Tote. I love the size. It's 8" tall, and the bottom narrows down to just under 5". The bag can be made to 1 1/2" deep, or expand up to 2 1/2" deep. Depending on what you want to add. So, I really love that! For the decorating, I just copied what I did on the card. The body ofthe card is made from Baja Breeze cardstock. I layered and cut the pattern papers in the same manner as the card. I set out to make a matching set. I purposefully made them 'the same'. 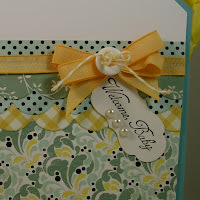 For the sentiment, I wanted a more decorative tag, so I used my Lots of Tags die set to create the shape. 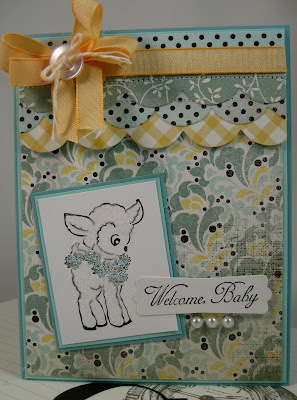 I used the same sentiment stamp: Welcome Baby stamped in Jet Black Staz-On pigment ink. 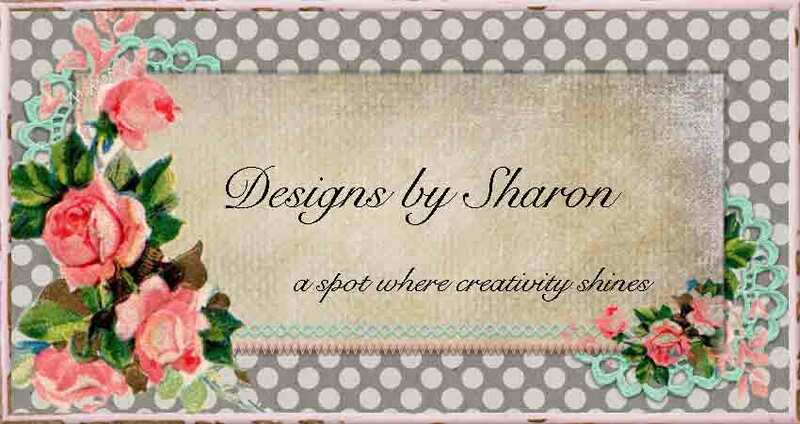 Instead of adding the trio of pearls under the tag, I added them to the decorative label. The other thing that I changed on the bag, from the card, is that I didn't machine stitch each row of scallop trimmed pattern paper. Instead, I machine stitched the taffeta ribbon. Because I had a mis-stitch with my sewing machine, I added the multi-loop bow to the opposite side of the bag, compared to the card. Thank you for stopping by today. 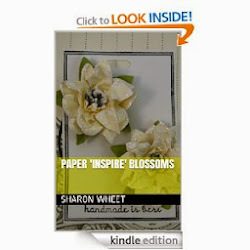 I hope I have inspired you to craft something today. And yes, I consider baking/cooking as crafting. I'm off to machine sew some tiny scallop squares together to alter a few more onesies. It's good to have a few on-hand, and in my Etsy shop.